Bill Maher is one of the most politically astute humorists in America today. His unflinching honesty and commitment to never pulling a punch have garnered him the respect and admiration of millions of fans. In 2003, Maher launched a new show, "Real Time with Bill Maher," on HBO, a network that's a perfect fit for his irreverent style. The hour-long show airs live at 11:00PM on Friday nights. "Real Time with Bill Maher" has received multiple Emmy nominations as well as nominations from the Writer's Guild of America. Some of the outstanding guests who have appeared on the show include Howard Dean, Michael Moore, Robin Williams, Drew Barrymore, Bradley Whitford, Rev. Jesse Jackson, Gen. Wesley Clark, Susan Sarandon, Kevin Costner, Gary Hart, Pat Buchanan and George Carlin. Each week, Bill's hilarious opening monologue, incisive interviews and stimulating panel discussion, as well as his extremely popular "New Rules" segment, serve to wrap up the week's most important events in a way that makes you think, as well as laugh. In 1993, Maher created "Politically Incorrect." On Comedy Central, Maher brought together some of the most interesting politicians, entertainers, and journalists to participate in some of the most controversial, topical and comical discussions. 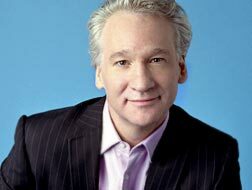 Winners of four CableACE Awards combined, Maher and his program grew in popularity year to year, eventually catching the attention in 1997 of ABC and capturing the post-"Nightline" time slot. A cutting edge contender of provocative late night television, "Politically Incorrect" survived for five years on ABC and concluded its final run in July 2002. "Politically Incorrect" received a total of 18 Emmy nominations since 1995. Maher, inspired by the show's success, assembled some of "PI's" most memorable highlights in his book, Does Anybody Have a Problem With That? Politically Incorrect's Greatest Hits.